We strongly believe that it should be compulsory to enjoy at least one serving of traditional tapas during every visit to Spain. After all, it’s where this increasingly fashionable cuisine originated! These tiny dishes were originally served as a free snack alongside a drink, adding a delicious savoury element to the refreshment. 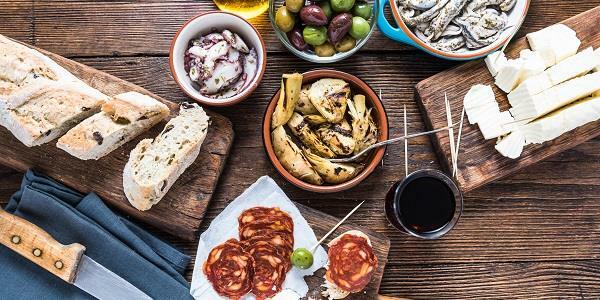 Tapas bars can now be found all over Spain, and holidaymakers don’t have to travel far from our El Pueblito de Alfaix property in order to grab a bite. But before you dig in, let’s go back to the beginning. There are several stories about how tapas came about. One of the most popular is that, during the 13th Century, King Alfonso X of Castille was recovering from an illness and could only stomach food and drink in small amounts – the first tapas. The King loved it so much that, when he returned to health, he decreed that all drinks should be served with a small snack! A second tale takes place later on, in the 19th Century. Alfronso XIII ordered wine in a popular tavern in Cadiz. The city was (and still is) rather windy, and so the bartender served the drink with a slice of ham balanced on top to keep the sand out. The King enjoyed it so much that he ordered it again, and others followed his example. 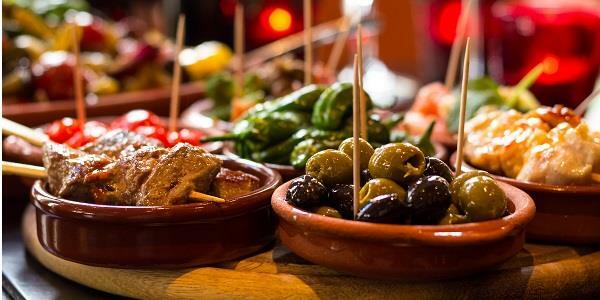 Of course, the idea of tapas being served on top of a drink is a common theme throughout these stories – after all, tapas literally translates to “cover” or “lid”. Another tale tells of how tapas bars never used to have any seating, so the only way to hold your snack was to balance it on top of your cup. A second version explains how a farmer’s bar would serve sherry or beer with a saucer on top to keep the flies out. They realised this saucer could used to serve some olives, ham or cheese, which also turned out to be a great way to win return customers! Last but not least, one retelling claims that one sneaky proprietor realised that if he served his cheap wine covered with a plate of strong-smelling cheese, the punters tended to be overwhelmed by the smell and not notice how bad the drink was! Aceitunas – Olives, sometimes filled with red bell peppers or anchovies. Croquetas de jamón Serrano – The traditional Spanish croquettes, made with Serrano ham. Calamares a la Romana – Known as calamari in the UK, these are rings of battered squid. Patatas Bravas – Diced, fried potatoes, served with a spicy tomato sauce, mayo or aioli. Boquerones en Vinagre – Fresh anchovies marinated in vinegar and seasoned with garlic and parsley. Tigres – Mussels which have been stuffed, breaded and friend. Traditionally, you can enjoy tapas in most bars before lunch and dinner. Remember that in Spain, meals tend to be served much later - tapas at 1pm, followed by lunch from 2pm, then tapas again from 8pm with dinner even later. These days, however, people are increasingly putting together several servings of tapas to build a whole meal! This way you get to sample everything on the menu, and it’s a great way to share a sociable bite with friends and family. If you fancy a bit more variety, tapas-hopping is an enjoyable way to spend a few hours. Gather everyone together and set off through town, visiting several bars in succession. In each venue, treat yourself to a glass of wine with a plate of the tapas speciality, and get a taste of all the local area has on offer! For those staying at El Pueblito de Alfaix, you’ll find the city of Garrucha just a 20-minute drive away – the perfect place for your tapas adventure! With the sea right on the doorstep, it’s no surprise that the seafood dishes found throughout the city are not to be missed. In fact, you’ll be spoilt for choice when it comes to places to eat, but the popular tapas restaurants Tierra y Mar and Boracay are a good place to start. Good food, stunning scenery and great company are at the heart of any stay at El Pueblito de Alfaix. For more information about how you can enjoy a stay in our beautiful holiday property, as well as many others across Europe, please don't hesitate to get in touch.